There is a big variety, cosmopolitan to virtually empty, white, golden, or dark sand, pebble or rocky, natural or improved, well organized to completely isolated, in green or desert like environments, still, lagoon to rough ocean-like waters, Cyprus beaches have many combinations of properties. Beaches in Cyprus are clean, and more than 50 have been awarded the Blue Flag eco-label (www.blueflag.org) while 30 have handicap facilities. Many beautiful beaches can be found in close proximity to Pissouri Village to explore, to lie on, to swim and to laze in comfortable sunbeds with umbrellas. Best of all they all offer turquoise and crystal-clear blue waters. The nearest beach to pissouri village is in pissouri bay around 3km away a great Blue Flag beach runs the full 1.5 km length of Pissouri bay, with crystal clear waters and a sand and pebble beach about 90 meters wide. It runs from Cape Aspro Point at the western end to the “Black Rock” headlands at the eastern end. Pissouri beach offers a wide selection of water sports to suit everyone. Whether you're after a thrill of adrenaline or something more relaxing. Selection includes wind surfers, jet skis, paddle and banana boats. The beach has access ramps for wheelchair access and a lifeguard on duty during the summer months with easy reach of the numerous excellent tavern's, restaurants, cafes, and businesses of Pissouri Bay. 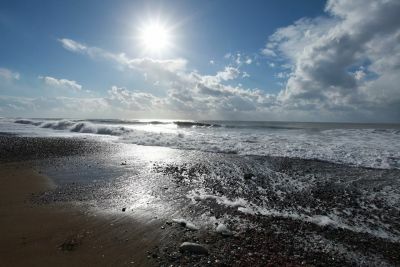 Another notable beach close just a 10 minute drive from Pissouri is 'The Birth Place of Aphrodite'. The Goddess of Love is reputed to have risen from the foam of the gentle waves , this headland is a focal point for a stunning piece of coastline. One can almost see her form in the shapely rocks, viewed at sunset this simply breathtaking. Also close to Pissouri is Melanda Beach which is a small cove at the western end of the Avdimou Bay, with access from a narrow rural road off the B6 diversion route not far to the east of Pissouri. The beach is served by a single taverna, and has a small, picturesque jetty for the fishing boats that make Melanda their home. The beach is narrow, but the waters are very shallow, making it the ideal spot for families with small children. Protected by the headlands between it and Pissouri to the west, the waters are calm and, due to the shallowness, warm both early and late in the season. The visiblity of the warm waters is an attractive draw card for snorkelers and divers alike, diving possibilities range from the famous wreck of the Zenobia to long forgotten artifacts gradually being reclaimed by the ocean. The Zenobia ranks as one of the top 10 wreck dives in the world, and is situated less than two km from the Larnaca shore, like the Titantic she went down on her maiden voyage and is amazingly well preserved with no salvage work being allowed. Life on beaches in Cyprus can be busy, social or relaxed, - something for everyone including a few turtles that nest right on Pissouri beach. The typical central Limassol beach has on top, luxury hotels built right on it, while at Pissouri the package also includes high slopes/cliffs on the bay’s two sides. The typical Paphos beach (east of Paphos castle) is similar to what is found in central Limassol. One is likely to find peace and quiet in more isolated beaches like those in the east of Latchi and Polis (Argaka, Pomos). To the east of Limassol there are beaches with the extraordinary combination of dark sand and white rock while on the west coast (north of Paphos), the seas are rougher. Those seeking complete isolation should go to Lara coast (west side of the Akamas peninsula). Towards the east (Protaras and Ayia Napa), the beaches have gold or white sand, and the water is usually calm. Nissi beach is the postcard Ayia Napa beach, while Protaras bay beach and Konnos beach are the most well known beaches in Protaras. The typical Larnaca beach is organized and has dark sand. A number of beaches especially in Pyla and Oroklini (or Voroklini) have wavebreakers.